The Dyson Airwrap styler claims to produce curls without tangling or causing heat damage — but the technology will cost you. Gone are the days when a glamorous blowout required a hair dryer, a round brush and a curling iron. 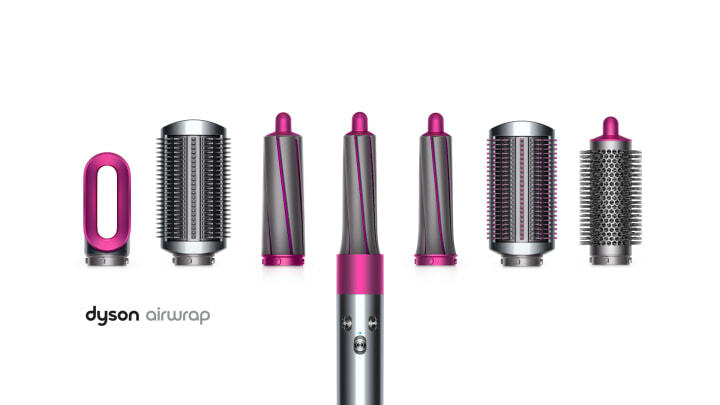 Dyson's latest invention consolidates everything you'll need into one tool: the Airwrap styler. Now, after much anticipation, Dyson has launched another tool: a multiuse styler, which can dry your hair while it curls it. Magic? Nah, just science. Engineers at Dyson started the process by looking at how people currently curl their hair. This is also available on Ulta and Neiman Marcus. "The old-fashioned way of doing curls is to put (hair) around an iron or use a round brush where you get all tangled up," James Dyson, the British inventor and famed founder of the company, explained to TODAY Style. "Both of those methods have a problem — one tangles the hair and the other damages the hair. "We knew — or we thought — that we could make hair go around a barrel using air flow," Dyson added. "It's a thing called the Coanda effect. ... Because if you could, you could make curls by just getting air to follow around the cylinder. (The hair wraps up) and then you just pull it out, so there's none of the tangling." For people who have spent years twirling strands of hair around a piping hot curling iron, that might be a hard image to grasp. But imagine this: You hold out a section of hair with one hand and the styler in the other hand. The circulating airflow whisks your hair around the barrel — yes, all on its own — and, after holding for a few seconds, creates the curl. The best part? It's designed to work on damp hair. So that means you're able to dry and curl your hair at the same time. There is heat involved, but a computer in the tool monitors the temperature 40 times per second, making sure hair doesn't reach the point where it's being damaged. "It's a problem-free way to curl the hair, which hasn't been possible in the past," Dyson said. Of course, all that technology comes at a price. The Dyson Airwrap styler, which launched Tuesday, October 9, costs $499.99 for the basic kit with a mix of the curling barrel attachments, plus brushes and a drying attachment. The drying attachment is basically a smaller version of the Supersonic hair dryer, while the brush attachments can be used to straighten or add volume to the hair, depending on what style you're trying to achieve. Dyson said his company will continue to look for innovative solutions in the beauty industry. "It's an area that interests all of us, all of the engineers," he said. "Because they love using technology to do interesting things. And perhaps this is the one area where technology hasn't really been used. And there are lots of lovely, interesting problems — how to make hair curl is actually a very interesting engineering problem. So we love doing it from a professional engineering point of view. But also, it's really, really important to people. And it's important to people to clean their homes, so vacuum cleaners are not unimportant, but beauty is of even greater importance to people. And I understand that. "So in a way, it's more fun doing beauty products because you get a more immediate, visceral reaction — a pleasure you don't always get with vacuum cleaners." For a more affordable curling tool one editor loves, check out this gadget that curls hair in under 10 minutes. This story was originally published Oct. 9, 2018.